Starting out in the music industry and want to get your music heard? It’s easier said than done but according to DJ Target you have to “find a way to stand out”. “I know it sounds clichéd but something original and isn’t on offer from another 100 artists in your area definitely helps,” he tells Radio 1 Newsbeat. It’s just a snippet of the advice he’ll be giving to some of the 15,000 budding musicians attending BBC Music’s Introducing Live on Thursday. He also says the key to success in 2018 is to stay true to yourself. Newsbeat’s been chatting to other artists ahead of the event who also say it’s important to not follow the crowd. “Every time I see an artist in trouble or struggling I can tell that someone else is telling them what to do and it doesn’t feel authentic,” says Halsey. The singer mastered the tried-and-tested route of YouTube covers to SoundCloud originals followed by a string of pop hits to spur a massive following. She insists on trusting your gut. Singer-songwriter Billie Marten, who says BBC Introducing “was the start of it all” for her career, agrees. She suggests being brave enough to turn down certain offers at the start of your career can help you stand out further along the line. “There’s a tendency, especially for young artists, to pulled and stretched like cheesed into something that is fashionable,” she says. “Not that it happened to me but if I said yes to everything it probably would have. 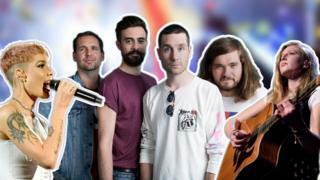 For Bastille, developing their own style was vital in the early stages of their career. “Let’s say you’re building a house,” explains keyboard player Kyle Simmons. Drummer Chris Wood adds that being an all-rounder goes a long way in the music industry. “Everyone tends to practise what they’re good at because it’s fun.